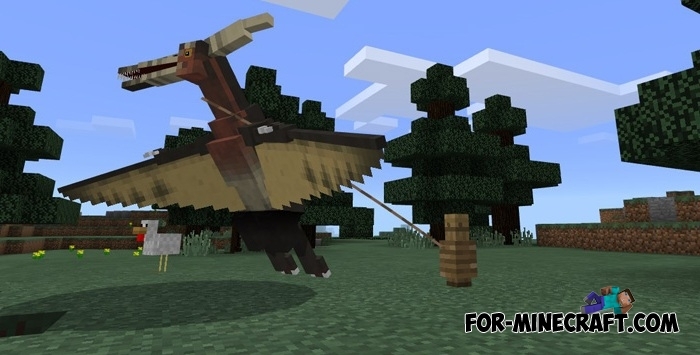 The small pack includes different add-ons for Minecraft PE 0.17.0. Here you will find unique dinosaurs that will diversify your world. Raptors, Compsognathus, Tylosaurus and other dinosaurs are included in this pack, you only need to download and install the addon. See below a detailed description. Perhaps this is the most popular dinosaur of all. Everyone has seen it in movies, read about it and now the raptor will be added to your game. The addon consists of 5 different growth stages of the dinosaur. Each stage is different from the other in size as well attack power and health points. You will be more difficult to tame large creatures and some of them will become very dangerous. You need to feed it and your creature will constantly grow up. Of course, you can ride it and use the dinosaur as a chest for things. Another creature which existed millions of years ago. Looking up, you'll see these reptiles instead of the usual bats. Addon like the previous one contains 5 growth stages. But unlike the raptor, ludodactylus can fly and also used as a transport. Feed it with any fish and it becomes your friend. Unfortunately, you will not be able to control the creature during the flight. But otherwise it's a great new mob for Minecraft PE 1.0. Another add-on for those who like to run away from dinosaurs. Compsognathus is quite small (about half of your height) and are always ready to attack you. One such dino is not so dangerous, but if you are surrounded by a flock of them then run and save your lives. Compsognathus inhabit the desert so run there. If you have little health points then take in hands a piece of meat, it will distract them. In addition, you can breed Compsognathus by the same meat. 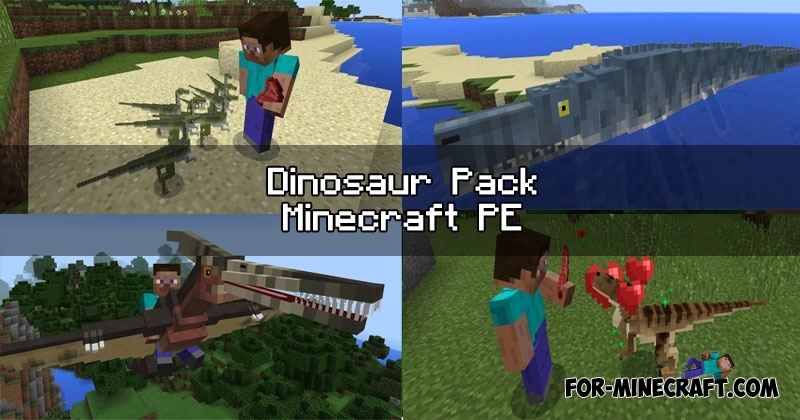 If you install all of the dinosaur mods that are included in this pack, you can turn the game into Jurassic Park. And here is another addon replacing the zombies in Spinosaurus. And here is another MCPE addon which replaces zombies. 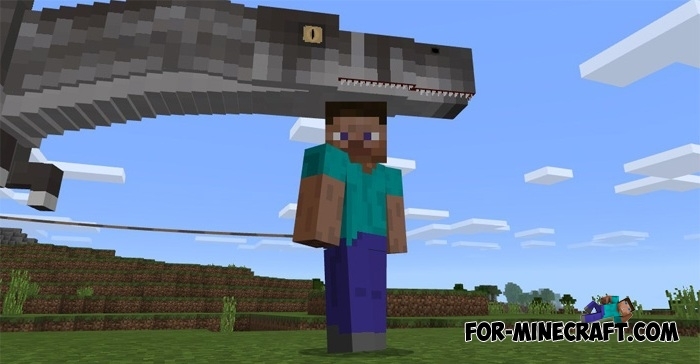 New mob has powerful jaws and will attack any enemy. Like many of the previous ones, Spinosaurus addon is also composed of 5 different stages. Each stage is unique, you will see different creatures both large and small which have different characteristics. For example, the first stage is a small baby. You can feed him, and it will grow rapidly. The last stage is a huge Spinosaurus having multiple abilities. You can tame it, ride it, use it as a chest to carry things and tying it with a leash. If large predators have bothered you then this addon simply diversifies surrounding fauna. The Small Dinosaurs addon includes 4 small dinosaurs which are completely harmless and will not attempt to eat you. They will exist peacefully in the world, to run away from you if you'll come close, and they are prey for larger dinosaurs from the previous addons. That is, if you install the Raptor addon and this one at the same time, then the raptor will use small dinosaurs as food. Moreover, the new dinosaurs have growth stages and can be tamed. Use fruits and vegetables to feed and breed them. They look quite nice, and maybe you will be using them as pets. In this pack it is the most dangerous dinosaur. It causes serious damage and has a lot of health, making it one of the hardiest of creatures. 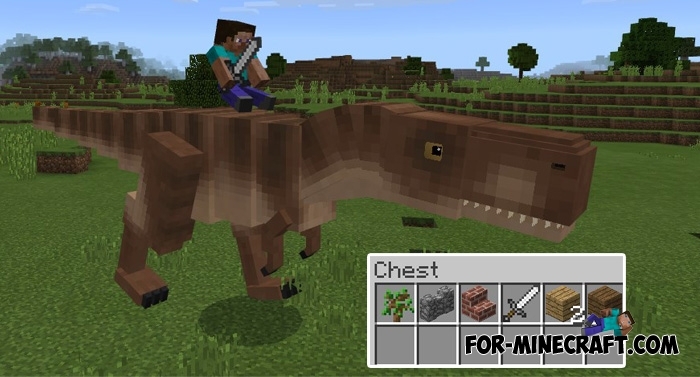 T-Rex is several times higher than you and hunts for all peaceful animals. You can also tame it and use food for growing. Like many other dinos, T-Rex has a work chest, where you can put any items. Beware of it when the dinosaur grew to the last stage. At that moment it is very dangerous and can bite you only a couple of times to kill you. Tamed baby will be your protection only at the moment when you grow it. T-Rex babies have low parameters and they die almost immediately in the first battle. Other dinosaurs will be added in the future.